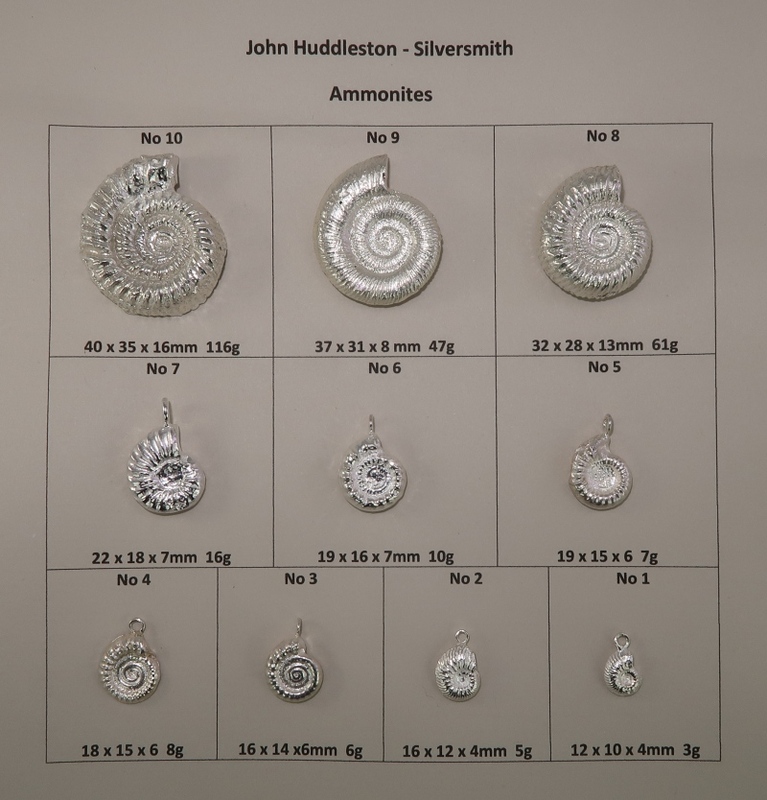 I cast my ammonite jewellery from real ammonite fossils and you can see the results in the chart below. I can cast them complete or half thickness. 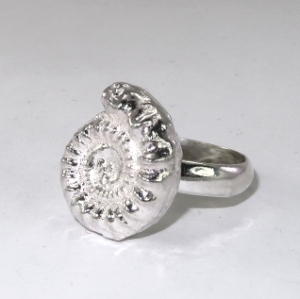 I can turn the cast ammonites into brooches, cufflinks, earrings, keyrings, paperweights, rings and maybe other things I haven't thought of. Please have a look at the chart to see the sizes then click the link to whatever you want to see what I have in stock. If it's not listed or if you want to see a picture of the actual piece I will send, please contact me. 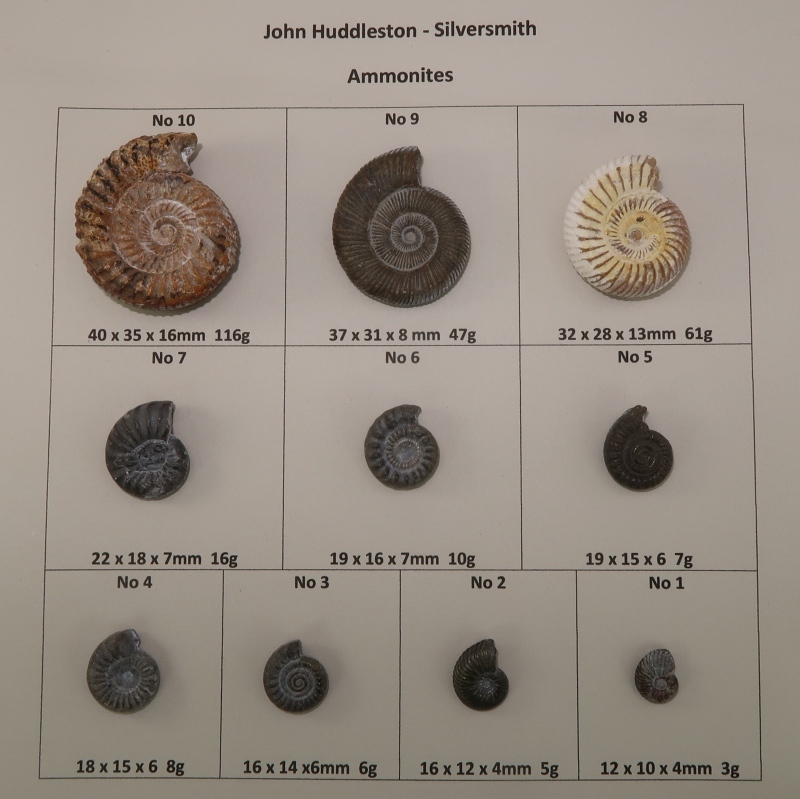 Here is the key to the ammonites and their sizes and approximate weights if cast complete. You can see images of the actual ammonites at the bottom of the page. 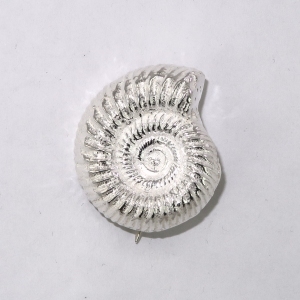 This is an example of an ammonite for a paperweight. 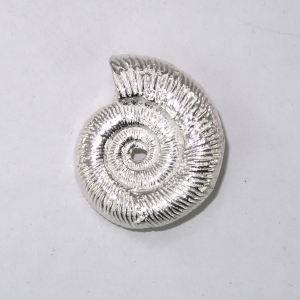 I can make full or half thicknesses of any ammonite, typically sizes 10, 9 and 8. Below is my current stock. If you want something different, please contact me. Two examples of ammonites as brooches. The left hand one is size 8. The right hand one is size 9. As shown it has a hole in the centre though I sell one without the hole. Brooches are half thickness. Do be aware that these are heavy and need to be fixed to a heavyweight material to support that weight.I could mount them with a pin and pin protector if required and also add a safety chain. Please contact me. 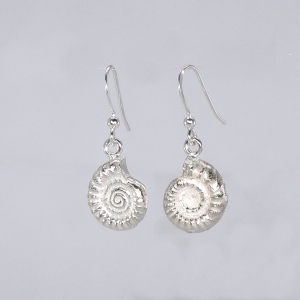 Examples of ammonite earrings. The left hand set are size 1 or 2 and the right side are sizes 3-5 and are half thickness and individually hallmarked. Almost any earrings can have danging stud or clip fittings. If your choice is not listed, please contact me. 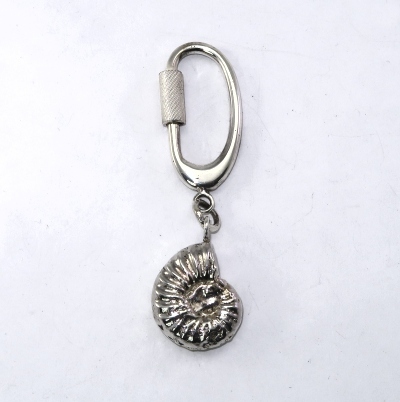 This keyfob has a size 7 ammonite. Other sizes available on request. 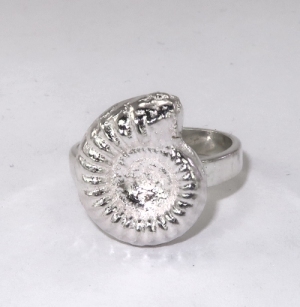 Two examples of a solid silver half ammonite on a simple silver band. The one on the left is a size 6 ammonite on a size N band. 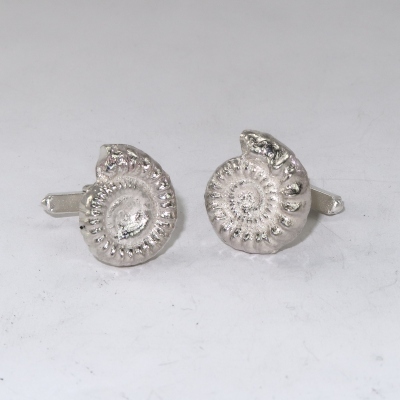 The one on the right is a size 5 ammonite on a size O band. I can readily upsize a ring by a size or so. I can also make other rings to your requirements. PLease contact me. 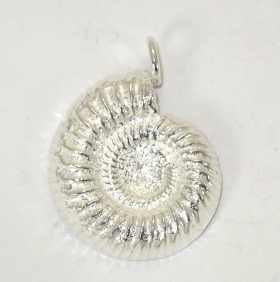 These are examples of half thckness,but otherwise solid, ammonite pendants. Ones with a decorative gemstone are just below. Referring to the chart above, the left is size 1, the middle size 7 and the right size 9, though not to scale. 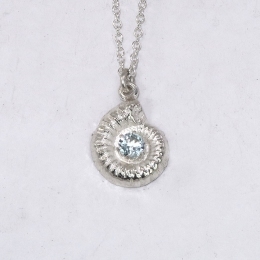 Smaller pendants come with a 16" trace chain and the large ones an 18" Belcher 3. 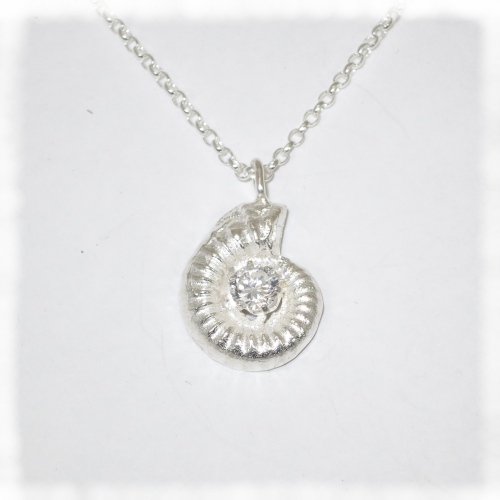 If you want a different ammonite or a different chain, please contact me. 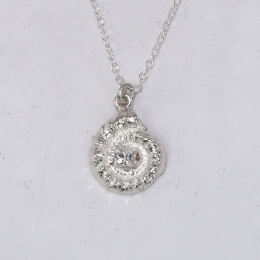 Please note the size 9 pendants are around 50 grams - six times heavier than the smaller ones. 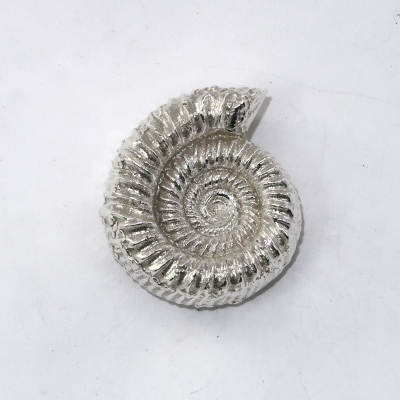 These are examples of half thickness, solid silver ammonite pendants with decoration. Referring to the chart above, the left is size 4, with a round cubic zirconia diamond simulant, the middle size 5 with a real light blue topaze and the right one is size 6 with a square cubic zirconia. These come with a 16" trace chain. 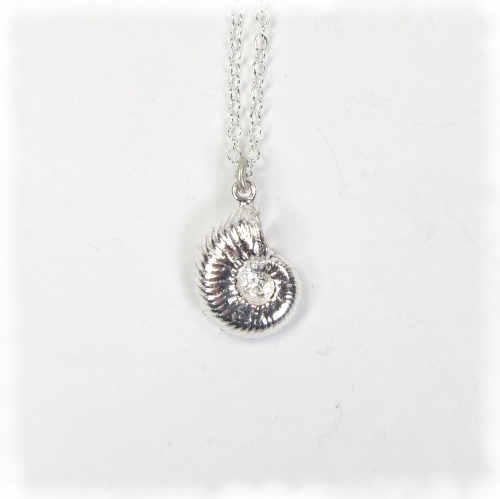 If you want a different ammonite, gemstone or a different chain, please contact me. 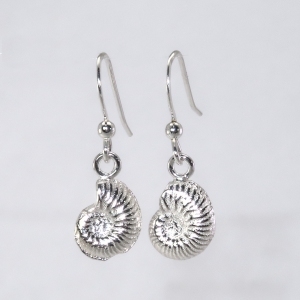 A size 1 or 2 solid ammonite such as those shown above as earrings. I provide a joining ring which is like a tiny keyring and, as an alternative, a an open ring that can be closed with pliers or soldered. Sorry - this is an idea that I haven't followed through yet. 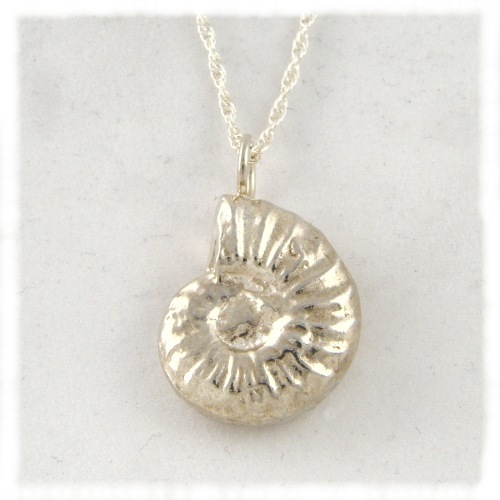 In my mind I see a half ammonite, say a size 6, sitting on a simple oval or round wire. Please contact me.